We’d love your help. Let us know what’s wrong with this preview of Astronaut Academy by Dave Roman. Hakat Hakata Soy's past life as the leader of a futuristic super team won't stay in the past! To ask other readers questions about Astronaut Academy, please sign up. Is this the first book in the series? What a funny, weird little story! I don't really know what I thought this was about, but I wasn't expecting it to be so gleefully goofy. Great for tweens-adults, includes a diverse & adorable cast of little space students who take classes in stuff like "Anti-Gravity Gymnastics" and "Driving Dinosaurs." More than anything this reminded me of Scott Pilgrim Jr, but in space. Also I would just like to mention that there is a panel where a robot speaks entirely in Tori Amos references: "Caught a What a funny, weird little story! I don't really know what I thought this was about, but I wasn't expecting it to be so gleefully goofy. Great for tweens-adults, includes a diverse & adorable cast of little space students who take classes in stuff like "Anti-Gravity Gymnastics" and "Driving Dinosaurs." More than anything this reminded me of Scott Pilgrim Jr, but in space. Okay, before I start, read that synopsis again. Futuristic super team. Anti-Gravity Gymnastics. Robot doppelganger. TACTICAL RANDOMNESS. Is is any surprise that I wanted to read this super bad? The cover just made me want to squee in adorableness. So already, my review is going to be positive, yes? Like I said before: this book is adorable. The art style is very simplistic and clean, and it only adds to the plot. Well, not really. There isn't really much of a plot. It's more of a slice-of-life type of book, and although there is an overarching plot involving the doppelganger, it doesn't really feel like one. There are lots of POVs in this comic, and every time it switches over, a new page and a small title on the top announces the change. The title is a running gag, as it introduces the character narrating and a phrase that explains the correlations to Astronaut Academy. For example, the opening page can be found here. Although I hate reading multiple POV in "normal" books, this novel somehow manages to make it work, and that makes it fine with me. You can tell that the author had fun making this, because he throws in plenty of humorous lines that you normally wouldn't find in literature. Very sarcastic stuff. But even with all that snarky humor, you'll occasionally find some very poignant stuff. A character named Doug Hiro usually provides very quiet and insightful observances. He's a student who loves space so much that he wears his spacesuit all the time, and prefers to stay outside in the eternity of space. He really brings another side to this otherwise bright and cheerful book, and it really illuminates the vast array of differences among the characters. A group of students are in space at the Astronaut Academy, learning about science, math, how to properly float in space and (for at least one student) how to throw a fireball that could save your life. Each short chapter focuses on one character's perspective, and through the course of the book we become familiar with many residents at Astronaut Academy. The main one is Hakata Soy, who truly does sport a fantastic hair-do, which leads some of the girls to swoon. Some flashbacks from Hakata's pre A group of students are in space at the Astronaut Academy, learning about science, math, how to properly float in space and (for at least one student) how to throw a fireball that could save your life. Each short chapter focuses on one character's perspective, and through the course of the book we become familiar with many residents at Astronaut Academy. The main one is Hakata Soy, who truly does sport a fantastic hair-do, which leads some of the girls to swoon. Some flashbacks from Hakata's previous adventures are shown, so we learn who he was as well as getting to see his emo side at school. This title is compiled from a web comic called Astronaut Elementary, and I am pleased to see it released in a graphic novel format. It felt Japanese-inspired to me, and this helped its appeal. As an example, two girls are talking in the foreground about a third girl, who happens to be close enough behind them to hear them. She looks properly dismayed, and signage over her head reads "*overhear*". Plus, most of the characters have Japanese names. Hakata Soy is a young former space hero just starting out at the space based Astronaut Academy. Starting with this simple premise we are introduced to a large cast of characters and many inter-weaving plot lines. The book is made up of lots of short stories told from alternating perspectives all of which are connected to tell a larger story. Because of the structure of the book I found it best to be read in short bursts rather than straight through. Astronaut Academy is very funny. I often find c Hakata Soy is a young former space hero just starting out at the space based Astronaut Academy. Starting with this simple premise we are introduced to a large cast of characters and many inter-weaving plot lines. The book is made up of lots of short stories told from alternating perspectives all of which are connected to tell a larger story. Because of the structure of the book I found it best to be read in short bursts rather than straight through. Astronaut Academy is very funny. I often find comedy in comics to be more humorous than genuinely funny but I found myself frequently laughing out loud while reading this. It’s an all-ages book so the humour is very silly which I suppose is part of the fun. It pokes fun at all kinds of science fiction including time travel, superheroes and anime. Packed full of jokes there’s plenty here for both adults and children to enjoy. It really reminded me how much fun all-ages comics can be. Adventurous. If you like cute comics, and space adventures, this is a good comic for you. I picked up his book while Dave was in town for Kids Read Comics, and I’ve been reading it over and over ever since. It’s one of those rare comics aimed at young people written and drawn by a guy who actually remembers what it’s like to be a kid. The comic is filled with an exuberant sincerity, the characters are super fun, and the jokes have that rascally sweetness that you rarely find outside of a Muppets special back when Jim Henson was alive. The story is about a group of students attending a I picked up his book while Dave was in town for Kids Read Comics, and I’ve been reading it over and over ever since. It’s one of those rare comics aimed at young people written and drawn by a guy who actually remembers what it’s like to be a kid. The comic is filled with an exuberant sincerity, the characters are super fun, and the jokes have that rascally sweetness that you rarely find outside of a Muppets special back when Jim Henson was alive. The story is about a group of students attending a school in outer space, and the main narrative bounces around to be explored from the viewpoints of the various students and teachers. Each chapter is a mini-story about one of the students, sometimes in the context of the larger story, sometimes as a tangent. As we get to know these characters we’re constantly reminded of the dread looming over former space hero and newest student Hakata Soy as his past slowly catches up to him. At first I thought I would give this to Kumohitam's brother, but I won't even do that. I know this is a book for kids and/or young adult, but putting aside the childish tone of the book, the jokes aren't even funny. "Just because Maribelle crossed the finish line first, does not make her a true winner. You see, class, Maribelle forgot the most important part of dinosaur driving! Wearing your CUTE LITTLE HAT!" Um. Okay. (and no, this hat isn't a helmet so if you're trying t Disappointing. "I couldn't help but OVERHEAR because I was EAVESDROPPING.." Okay. Am I supposed to laugh here? "You wouldn't love a hobo, right? Please say no or I will have to GASP for air while I stop being your friend!" I know this is a joke. BUT WHAT KIND OF JOKE IS THIS??! 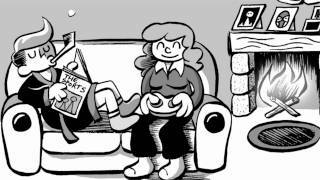 The problem with turning online comics into a graphic novel is that there is no story arc. This book is a series of disjointed scenes that aren't organized around a central conflict and don't actually tell a story. A series of characters is introduced and we learn bits about each one, but it never comes together or becomes anything more than that. A satisfying story is equal to more than the sum of its parts. This does not have all the components needed for a story. Reading this, and several other internet comics compilations lately, I have to wonder if this isn't contributing to our growing population of reluctant readers. If they are voraciously devouring short comic snippets, and nothing else of substance, perhaps young readers don't know how to approach, or sustain their interest long enough, to hook into traditional story structure. One Sentence Review: It may take you 50% of the book to get into this one, but once you've successfully processed what Roman's doing with the language the book is tons of fun and silly to the point of mental instability. Entertaining silliness in outer space. Six words: Children's Notable Graphic Novels Selection List. That is all. it was funny & most of all i liked the fire ball tournament & it looks rely interesting & i wish i could play fire ball!!!!!!!!!!!!!!! This 2011 book by Dave Roman is the first of a series that explores the adventures of the diverse student body at Astronaut Academy. The main character is Hakata Soy, a former leader of a super-team, whose just transferred to the academy. Yet this book is really a who's who of the attendees of the space station school. Most of the students and teachers are perplexed by the new student. Some want to be friends with Hakata, others are destined to be enemies. But everyone wants to know why he's no This 2011 book by Dave Roman is the first of a series that explores the adventures of the diverse student body at Astronaut Academy. The main character is Hakata Soy, a former leader of a super-team, whose just transferred to the academy. Yet this book is really a who's who of the attendees of the space station school. Astronaut Academy reminds me of a series of books from the 80s called Sideways Stories from Wayside School. Each chapter focuses on one character and their perspectives and interactions with others. Each segment can be read alone as it's own story or together as a thrilling novel about bravery and friendship. This book started off really strange. The flow just felt all wrong for some reason. Some of this is because the first 2-3 segments are framed like TV-commercials for the academy. But it's not until we meet the character of Hiro does things really seem to gel. Hiro loves to space walk. He is so fond of it, he always wears his space suit. Often he sneaks out of class to play hooky by floating in space. Honestly, his static look at life makes him the star of this book. Once characters like Hiro kept popping back up into the story, I felt like we had a winner on our hands. The art is a little crude but the overall story is enjoyable once a solid continuity was created. If your child enjoys books on life at a strange schools like Wayside or the Jedi Academy series, Astronaut Academy would be another fun place for youngsters to tour. Really bored when reading! I'm a fourth grade educator and my students love graphic novels. I have never been bored by a graphic novel until I read this one. There really isn't any plot and the novel just didn't grab my attention. Read this for Battle of the Books but was not a fan. I found it very difficult to follow. Illustrations were cute, but I couldn’t keep up with the story. WHERE CAN I FIND DA SEEQUEEL!!! this story is about a kid who had spent his life saving cities suddenly going to a school where he has to learn a lot of new things. The sarcasm is great in this one and I think it will really appeal to my 4th and 5th graders. Bonus points for diversity, -1 for mean hurling and using the word “sissy” to describe nerds. I would have given this 2 stars but it just went on for way too long. This review has been hidden because it contains spoilers. To view it, click here. I rated this book a 4 star because I really like the story line of the book. Welcome to Astronaut Academy, a boarding where students learn important skills such as anti-gravity gymnastics, fire throwing, advanced heart studies and Spanish. It's also where Hakata Soy, former space hero, has been sent by his parents. Unfortunately, his enemies won't leave him alone! With the help of his new friend Miyumi San, he'll try to make it through his first semester. This was pretty silly. It was also very tongue and cheek in a way I enjoyed but I think most middle school students, Welcome to Astronaut Academy, a boarding where students learn important skills such as anti-gravity gymnastics, fire throwing, advanced heart studies and Spanish. It's also where Hakata Soy, former space hero, has been sent by his parents. Unfortunately, his enemies won't leave him alone! With the help of his new friend Miyumi San, he'll try to make it through his first semester. This was pretty silly. It was also very tongue and cheek in a way I enjoyed but I think most middle school students, which is who it's written for, wouldn't really understand. I don't think that would prevent middle school students from enjoying this silly space adventure though. The story is told by many different characters, from Hakata Soy and Miyumi San, who were the main characters, to Hakata's roommate, who on the outside seems to only care about fireball, but actually has a sensitive side, to Maribelle Mellonbelly, the richest and meanest girl at Astronaut Academy and Miyumi's nemeses, to Cybert, the Hakata look-alike robot that has been sent to Astronaut Academy to eliminate Hakata Soy. And many, many others. The main plot is that Hakata is sad and mopey and missing his friends, and he can't contact anyone and no one contacts him! Little does he know that the bad guys, knows as Gotcha Birds, he previously defeated on Hoppiton (home of bunnies, that look like old-time Disney characters), are jamming his signal! One of his old fellow heroes, missing Hakata and unable to contact him, makes a robot that looks just like Hakata to keep him company. But then the Gotcha Birds steal it and reprogram it to sneak into Astronaut Academy and kill Hakata! Meanwhile, Miyumi , who has enough problems of her own fending off Maribelle Mellonbelly, befriends Hakata and ultimately ends up saving his life with her incredible fireball power! In between there is much ridiculousness, like dinosaur riding and panda bears who teach Spanish but are really secret agents. At the end, since Hakata hasn't been able to contact his family, Miyumi invites him over to her place for the semester break where her grandfather will see if he can fix Hakata's communication device. A fun read for all ages! If you're a kid then hopefully you can appreciate the sheer wonderfulness that is education in space, such as classes that involve DINOSAURS, and there's a decent side dish of teen flirtations...and if you're my age or older, you can appreciate all the shoutouts to 80s-90s cartoons, especially the ones coming straight from Japan, as well as live-action stuff like the Mighty Morphin' Power Rangers. You can read the blurb for a general idea of what this is about, although I A fun read for all ages! If you're a kid then hopefully you can appreciate the sheer wonderfulness that is education in space, such as classes that involve DINOSAURS, and there's a decent side dish of teen flirtations...and if you're my age or older, you can appreciate all the shoutouts to 80s-90s cartoons, especially the ones coming straight from Japan, as well as live-action stuff like the Mighty Morphin' Power Rangers. You can read the blurb for a general idea of what this is about, although I don't think the plot alone is the selling point. It's the whole package, taking a lot of tropes about school and science fiction and just having a lot of fun with them. Seriously, this is such a fun read. The artwork is wonderful greyscale, and before you retreat to the convenience of color let me tell you now that well-done black and white can be some of the best stuff ever. (Full disclosure: Roman & I spent several minutes geeking out about the wonderfulness of Jeff Smith's inks in 'Bone' at ALA.) To be honest, I think this series would be overwhelming in color. It's got lovely loose, flowing lines, and relatively simple art that conveys a lot of information without resorting to textwalling. The pace of the story is rapid and the art hits the right level to feed you what's going on without jumping into the realm of brainmelt, which I could easily see happening with a full color palette. This isn't a monochrome story. The narrative hops across different characters at the school, although there's an overarching plot that things feed back into. Sometimes you have to wait a little to get back to it, but I never even approached the realm of boredness. As I said, this is a fast-moving story and, yes, technically for a younger audience which works out great in the modern ADD age and also if you're a cool person who likes cool things. My only real complaint is there are a number of typos—enough where I thought 'BEE' (you'll know what that is when you get there) was one too for a few seconds—it's still readable, but it's the kind of thing that makes me hope extra hard for a reprint because a) this is awesome and b) it'd be nice to see those cleaned up. 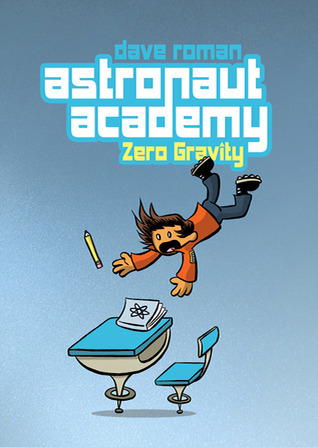 Astronaut Academy: Zero Gravity is the first of at least two planned books (the sequel probably coming out next year). It tells the story of Hakata Soy as the new kid at Astronaut Academy as he settles into the school and gets used to his classmates (who honestly, are just a wee bit weird) and tries to catch up to his classwork (he was held captive by his archenemies for a few weeks so was late to the start of school.) And as he settles in he discovers his enemies are still out there and maybe on their way. In the meantime Hakata has to navigate the weird waters of his classmates and hopefully make a couple of friends along the way. This has been a bit difficult of a book for me to review and I think that the main problem is that I'm not the target audience. The book is really meant for ages 7 to 14ish. And unlike other books for that age group (like Owly) it doesn't translate well for adults. The biggest problems for me are the sense of humor and the way the story has multiple subchapters, each only lasting a few pages, and then switching to another viewpoint. It's not a bad thing, it just comes close to doing my head in at the moment. So for adults...put yourself in the mindset of a 8 year old and go hog wild. 4. Hi Amanda and Jenn! I need some help coming up with graphic novel recommendations for my 10 year old stepson. He’s completely hooked on them but he goes through them so fast that I can’t keep up, so I desperately need your recommendations! He reads books with both male and female protagonists (he read El Deafo and Nimona) so I’m already planning to try your recent recommendation of Delilah Dirk and the Turkish Lieutenant. My husband and I have also exposed him to a wide range of subject matter (for example, he read George by Alex Gino) so we’re comfortable with anything. He read the Bone series by Jeff Smith but his absolute favorite is the Amulet series and he can’t wait for the next one to be released. Any suggestions for what other graphic novels (or series) I can get him?? Love the show, and thanks so much! Thank you so much for doing this podcast-l have read so many new books because of your recommendations. I’m looking for new books for my husband. He’s enjoyed The Radium Girls by Kate Moore, Packing for Mars by Mary Roach, and various YA non-fiction titles like Red Bandana and books on Jack London. His reading time is limited so shorter books that aren’t too dense would be ideal. He likes history, adventure, and booze. Any recs would be greatly appreciated. If you have time, my son is 9 and will only read graphic novels. He loves Doug TenNapel and Dav Pilkey. Any other age appropriate authors we could binge read? He’s read Amulet and Bone and enjoyed both. Thank you so much for your time. I love your show and can’t wait to hear what you come up with! My book takes place in the future where kids will go to school in space and learn about future things such as wearing cute hats, zero gravity gymnastics, and also run-on sentences. The main character in this book is Hakata Soy, a new student to Astronaut Academy, was a I guess you could say “space ranger” fighting these bird like people that are constantly terrorizing someone. As the plot develops new people join in the story and sort of have their own sort of storyline with Hakata Soy. As I read this book it was constantly dragging me into the story with its comic like text placement and the different types of people from around the universe. The style of the book was very good because while I was reading as I finish reading that text bubble in the corner of my eye, I could see a well drawn out picture of what the author was talking about. In my opinion this book is really good and I do recommend that other people read it. Even though I do not like reading at all it keeps me reading the book because of its style, witch in my opinion is very good for a person like me who would much rather play that video game right next to me and do other things beside reading this book. So there is an overarching plot to this book...eventually. This crime-fighting kid gets sent to Astronaut Academy by his parents and his arch-nemeses send a killer robot after him. That's the main framework, but it doesn't really show up until 80% of the way through the book and then the last 10% of the book is epilogues, so that should give you a picture of how much tight plot line you can expect. Overall, there's a bunch of random little vignettes to (I think) help y Well, that was...different. So there is an overarching plot to this book...eventually. This crime-fighting kid gets sent to Astronaut Academy by his parents and his arch-nemeses send a killer robot after him. That's the main framework, but it doesn't really show up until 80% of the way through the book and then the last 10% of the book is epilogues, so that should give you a picture of how much tight plot line you can expect. Overall, there's a bunch of random little vignettes to (I think) help you get to know the various students at Astronaut Academy. So the entire first half of the book feels somewhat disjointed, random, and you have characters who are speaking future English (I'm giving them the benefit of the doubt here) which comes off a bit robotic-sounding. Have you gotten the impression yet that I was not extremely impressed? I came this close to not finishing this. But I did. Which I guess is a good thing since the best part was the last quarter or so of the book. We'll see how the students react to this one. Most of the students at our school are ESL, so I'm guessing the dialogue is just going to confuse them somewhat, but I could be wrong. And considering it's a graphic novel, it'll probably still get checked out a ton. I will be interested to find out if they actually like it or not though. P.S. I've gotten feedback from a couple students now. They find this just as weird and random. Dave Roman is the author of several graphic novels including Astronaut Academy: Zero Gravity, Teen Boat!, Jax Epoch, and Agnes Quill: An Anthology of Mystery. He has contributed stories to Explorer: The Mystery Boxes, Nursery Rhyme Comics, and is the co-author of two New York Times bestselling graphic novels, X-Men: Misfits and The Last Airbender: Zuko’s Story. Roman is a graduate of the School of Dave Roman is the author of several graphic novels including Astronaut Academy: Zero Gravity, Teen Boat!, Jax Epoch, and Agnes Quill: An Anthology of Mystery. He has contributed stories to Explorer: The Mystery Boxes, Nursery Rhyme Comics, and is the co-author of two New York Times bestselling graphic novels, X-Men: Misfits and The Last Airbender: Zuko’s Story. Roman is a graduate of the School of Visual Arts and worked as a comics editor for the groundbreaking Nickelodeon Magazine from 1998 to 2009. He lives in Astoria, NY with his wife, and fellow comic artist, Raina Telgemeier.